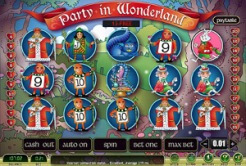 love the Party in Wonderland slots game. The theme is based around this delightful book and you will instantly love the characters represented through the use of superb graphics. It’s easy to play but you can get full instructions on how to play as well. The software works beautifully and draws you in without you even realizing it! The game is set up to show you three lines of five symbols on screen every time you spin the reels. Behind this you’ll see a fairytale land complete with trees and roots, so you really are in wonderland right from the very start. Are you used to playing games? If you are you’ll be well away with this one too. It has five reels and twenty one pay lines in all. Watch out for the characters from the book as some of them have a better value than others. The Cheshire Cat, the Mad Hatter and the Jacks and Kings too will all appear on the reels as you play. The scatter symbol is the Mad Hatter while Alice herself appears as a wild symbol. Alice in Wonderland is well worth watching for because she can win you some free spins. You’ll need two or more symbols for this to happen, but you can get between five and twenty free spins as a result. This is a great bonus to look for so keep your fingers crossed! You’ll find the game available to play at the Jackpot Joy. Some other casinos including the Liberty Slots Casino for instance, do not offer this game so watch out for it where you can. It’s definitely worth a go because it offers entertainment and cute characters as well as a chance to win a prize or two along the way. But be warned, you might find this game pretty addictive! It’s certainly great fun and very eye catching too. Why not try it now?